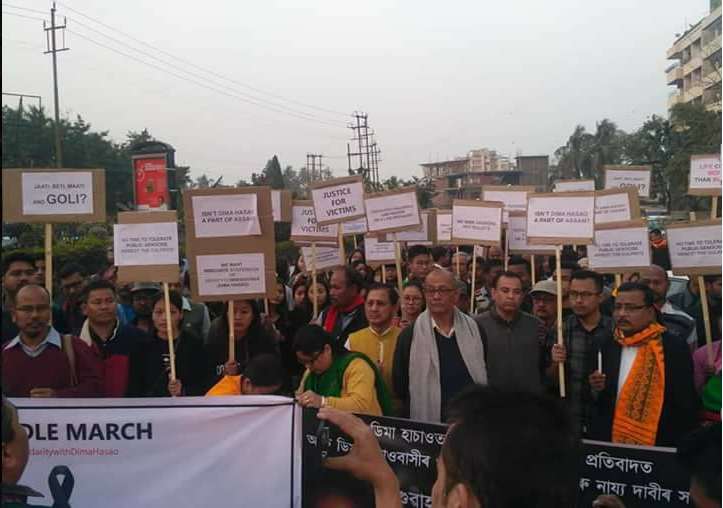 Citizens taking out a candlelight march in Guwahati in protest against Dima Hasao firing. On 27th of January every year, the colourful and peace-loving Dimasa people of Assam and Nagaland celebrate their most important festival, Bishu Dima – the festival of harvest. But this is for the first time in the history that the Dimasas have to shed tears of utmost sorrow and fury, on the eve of this festival. Why? All we asked for was a clarification about the so-called agreement signed between RSS / BJP and NSCN (IM) and about establishing a Satellite Council / Special Development Authority within Dima Hasao district of Assam, which was doing the rounds in social networking sites and other media. Instead of giving an answer, the Dima Hasao Deputy Commissioner Devajyoti Hazarika, ordered for the firing of live bullets on the peaceful protestors, killing two innocent souls –Mithunjoy Dibragede and Probanto Hakmaosa— and injuring many more (some are still battling in hospitals of Haflong and Guwahati). Bullets were shot inhumanly on the head, chests, neck and legs upon the innocent people including students (even girls). This happened at Maibang town in Dima Hasao district on the fateful day of January 25. The DC in his Republic Day speech had said that he was bound to order firing because the people were resorting to pelting of stones and de-railing the tracks, but did you forget, Mr Hazarika, that you had resorted to baton charge on the peaceful protesters first, instead of waiting for the bandh / strike to end for just another two hours (the bandh was scheduled from 5 am to 5 pm and the firing took place at around 3 pm.). Firing was ordered without any warning or any kind of non-lethal means of warding off the crowd like rubber bullets or tear gas. Live bullets were shot directly aiming at vital human parts. Could this be even imagined by a sane man? They were students protesting peacefully and not terrorists to be shot at, so cruelly. Now, after creating such an atrocious bullet play on innocent people, the State movement maintains that not an inch of Assam will go to Nagalim. Was the government waiting for people to die a torturous death and battle for life in hospitals, for giving this simple statement? The rest of the world has seen more violent protests for even minutest of causes, but nowhere in history have they been bullet fired so mercilessly. Moreover just by media posts and circulated notices which are without proper seal, you cannot befool people. Yes, we know that either the Assam government is trying to befool us or being puppets under the even higher agents who do not appear openly. Till today, no action has been taken against the DC of Dima Hasao, who we demand to be immediately arrested. This even deepens the speculation of the indifferent nature of the government towards its own people. We are bound to think so. For the rest of the non-Dimasas of Dima Hasao and of Assam as a whole, please be clarified that it is an equal issue for you because you all are from Assam like the Dimasas and not belonging to Nagalim or anywhere else. This is a fight for all of us. This is the time to forget our differences of religion, caste, tribe, language and affiliations. We are all people of Assam and we will be. And for the rest of the people of India, please be clarified that we are Indians too and above all, we are humans. Please understand the matter first and then have opinions instead of having wrong speculations and claims about us. We are not savage hill-dwellers; we are responsible and peaceful citizens of India. Before this year, every Republic Day and Independence Day, we gathered together for paying homage to our motherland just as the rest of India does. I have seen every single household of Dima Hasao used to hoist our National Flag on these occasions, which I doubt is not seen in most other places. (Talking about every household, besides the main celebration gathering and hoisting). The people of Dima Hasao are much patriotic, in spite of hearing offensive words from the people of rest of India, like ‘chinky’ or ‘junglee’ or ‘Chinese’ ; the list is far to be exhaustive. But this year, having received bullets in return of our claim to stay within our own land, do you think we could celebrate Republic Day? 25th January is a Black Day for us, 26th January 2018 is a Black Republic Day for us and 27th January 2018 is a Black Bishu Dima for us. Please stop inhumanity and anti-democratic means of hurting your own fellow national citizens like this. If you still do not consider us as equal citizens, go through history records and you will see that we were the autochthonous tribe of Northeast. We own a rich royal legacy still seen in relics and a beautiful landscape with immense scope for tourism in Dima Hasao. We are fed up of seeing blood, step-brotherly treatment and political games. Please get this through if you are Indians and if you are humans. Let there be peace for humanity’s sake. Note: The author belongs to Diamasa community and hails from Haflong.